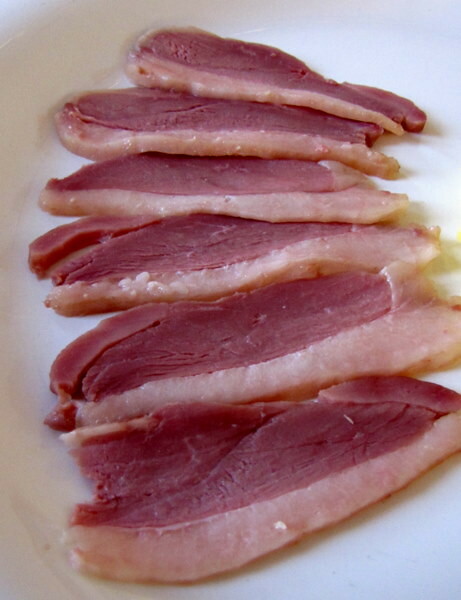 Hot-Smoked Duck Ham ~ I Can Do That! I never thought duck ham could be so delicious. I bought a whole duck which I was going to grill Peking-style but it got very cold outside at 30°F last Saturday. I didn't want to look ridiculous grilling while wearing a winter jacket so I abandoned the idea of Peking duck as it is a very involved process if cooked in a regular oven. I started to debone the bird but stopped to check for duck preparations in CHARCUTERIE by Michael Ruhlman and Brian Polcyn. Hot-smoked duck ham instantly caught my attention. It takes 2 to 3 days to prepare but it's worth all the work. The ham is flavorful, tender, and the sweetish salty fat deliciously melts in the mouth. If it's a little bit drier, it's almost like prosciutto or Spanish jamon Serrano. I'll see if I can find already boned duck breasts at the stores and will definitely make again for the coming holiday. If you are planning to smoke the ham indoors in the oven you can use 2 large disposable aluminum roasting pans, one smaller aluminum pan to catch the drippings, a metal rack, and strips of aluminum foil. Soak 1 cup of hickory chips in water for 30 minutes and place them on both sides of one of the pans, then place the small aluminum pan in the middle, place the rack on top of the small pan, then lay the duck breasts on the metal rack. Cover with the second roasting pan, covering the sides where the pans join with strips of aluminum foil. If you have a kettle smoker, set the temperature to 180° F.
Brine: Combine all the ingredients in a large pot. Place over medium-high heat and bring to a simmer, stirring to dissolve the salt and sugar. Remove from heat and let cool to room temperature, then refrigerate until completely chilled. Duck: Add to the chilled brine and weight down with a plate. Refrigerate for 8 to 12 hours. Rinse the breasts under cold water and pat them dry. Refrigerate them on a rack set over a small baking sheet and refrigerate for at least 4 hours, or up to 24 hours. Hot-smoke: Preheat the oven to 180 or 200°F and cook the breasts for 2½ hours or until internal temperature registers 160°F. Refrigerate until chilled. 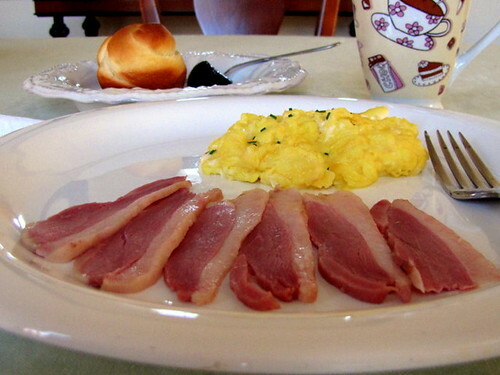 Oggi, this duck ham look so professionally done...I'd love to have a slice of it...yummie! This is breakfast a la king! A glass of orange juice might complete this upper-crust morning meal.Delectable indeed!!!! That definitely looks fantastic! I can imagine how scrumptious this would be in a sandwich made with ciabatta and whole-grain mustard! Tell me please if I can do the whole duck this way ? Thank you for your recipes !!!!! !